Nothing says “Five Minute Friday” like our Paper Pumpkin kits. I love that these kits are all inclusive – no searching for just the right ribbon or embellishment. I love that it includes everything including the adhesive. 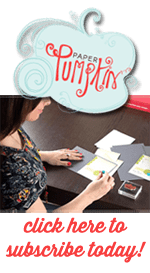 I can easily take just the box with me and add an acrylic stamp block and a pair of scissors and I am ready to assemble my Paper Pumpkin kit anywhere. I know I’ve shared a lot of Paper Pumpkin kits recently but I have a reason for doing this. March’s kit is our Fifth Anniversary Kit and I really don’t want you to miss out on a great kit. To get you in the mood for March’s kit, I’m sharing one of the cards from the February kit. I love that I had a couple different options on the choices for this kit: Thank You, Celebrate, or Friend. This really expands my options when it comes to the kits. I don’t have any sneak peaks for the March kit, but it sounds like it’s going to be a good one. They’ve designed a special box for March and it will include all the usual goodies (kit, stamp set, and ink pad), plus a FREE gift! You have until March 10th to sign up to get this month’s kit. If you sign up after the 10th, your first kit will be April’s. I recently had a question about Paper Pumpkin and what to do if you weren’t wild about the kit as designed. My advice was to just change it to be what you wanted. But I realize the whole point of the kit is that you don’t have to be creative to make it work. I’m thinking I need to start sharing some additional ideas for the kits. What do you think? Would you like to see some alternative ideas? Comment below and let me know! 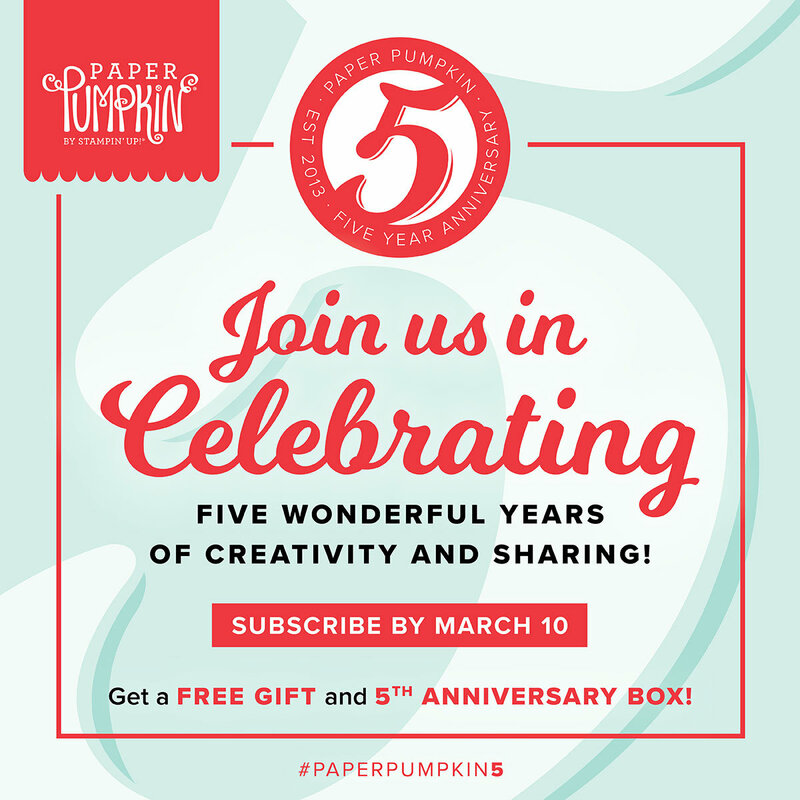 March is the 5th Anniversary for Paper Pumpkin. 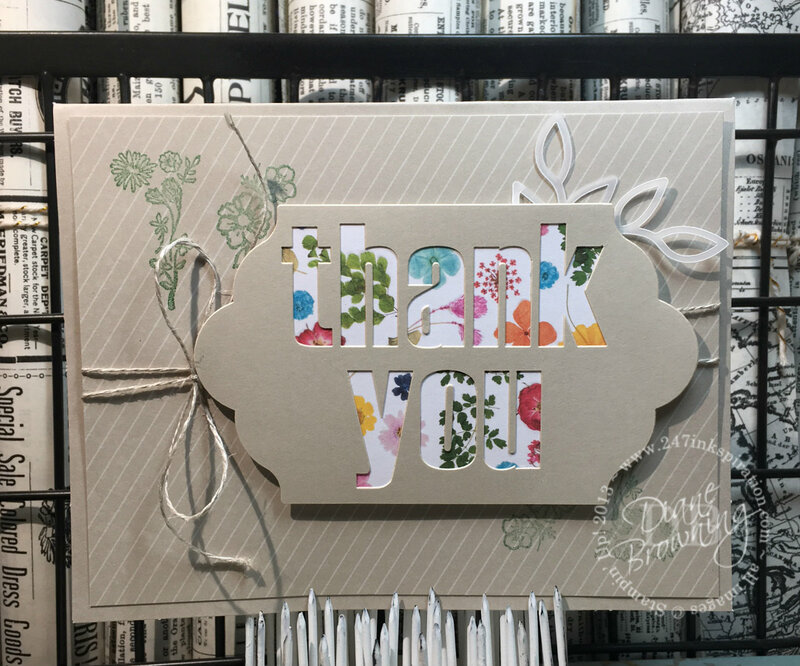 To celebrate, Stampin Up is including a FREE gift in every March kit and the box has been redesigned for March only just for the Anniversary celebration. If you aren’t already a subscriber, click the link on the left to take you to my Paper Pumpkin website. You need to sign up no later than March 10th to get the March Paper Pumpkin kit. These Paper Pumpkin kits are an excellent value at $19.95/month, including shipping.